Who doesn’t love Aloo? And if they are spicy and tangy, then they take a meal to a whole another level! 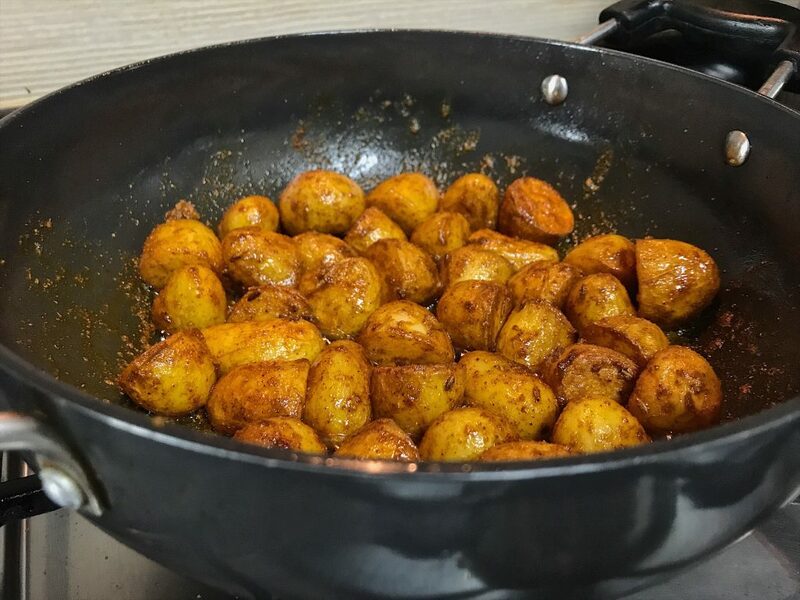 Chatpate Chhote Aloo or just Spicy Baby potatoes are one of my favourite side dishes in an Indian dinner spread. They are delicious, spicy, tangy and just what the names says. Its’s pretty straight forward. They are Chatpate- Chhote- Aloo! But these omnipresent small potatoes, also called seed potatoes in some supermarkets weren’t as omnipresent as they now are. 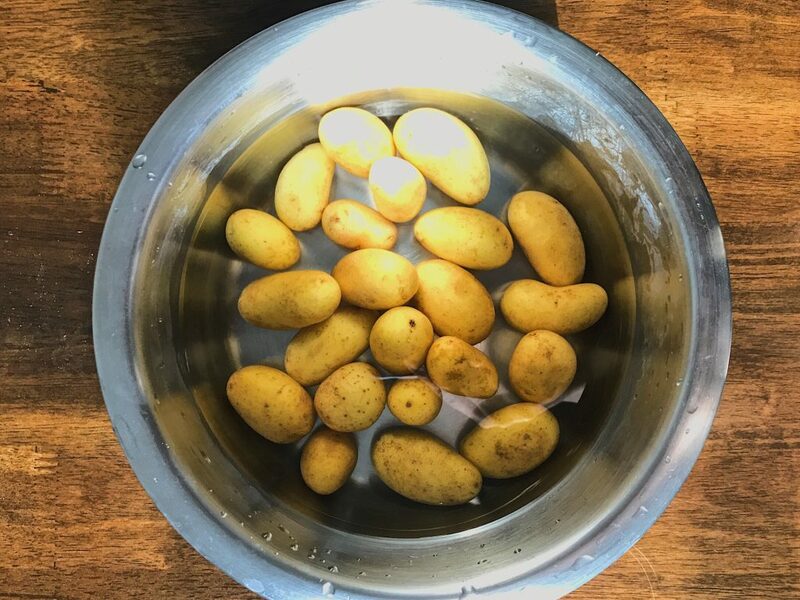 On a recent chat with my parents, I asked them questions about what I had heard them say to Sabziwalahs in India while buying potatoes, “yeh aloo meetha toh nahi hai?” (Hope these potatoes are not sweet) or “naya aloo kab la rahe ho?” (When will you source the new harvest of potatoes?). Now, they were not confusing Sweet potatoes with regular potatoes. They were simply asking if the potatoes they were buying weren’t an old cold storage crop. They favoured the new harvest of potatoes, particularly the Pahadi variety (Kufri Chandramukhi variety maybe) that came in winters. 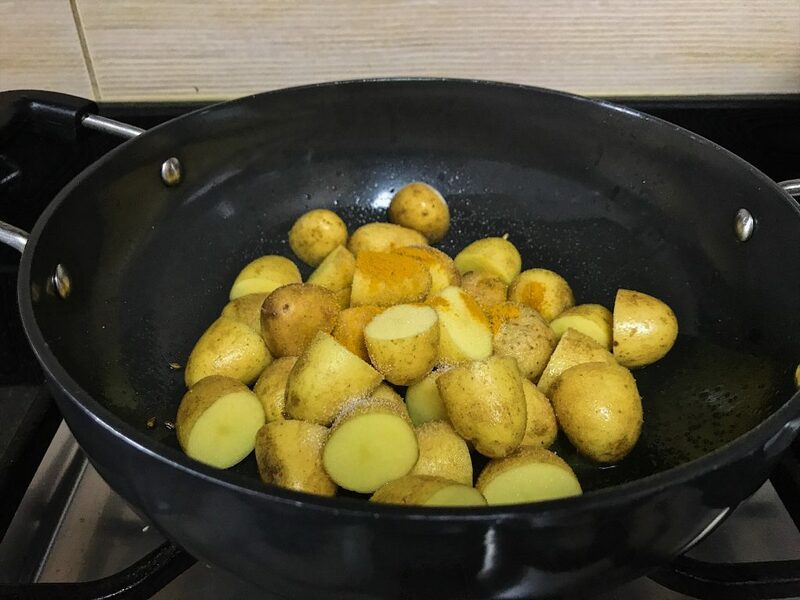 The peel for these new potatoes comes out easily and they cook easily. They were also not sweet since they were a fresher harvest. My Dad soon explained that older variety of potatoes that are stored in cold storage tends to turn sweeter with time and that taste is usually undesirable. But the Pahadi Aloo, cultivated in the Himalayas are famous for being flavourful and earthy. A simple google search about Pahadi Aloos told me that there are various Indian varieties of Potatoes most of them had a name starting with “Kufri”, the name of a small hill town in the Himalayas. 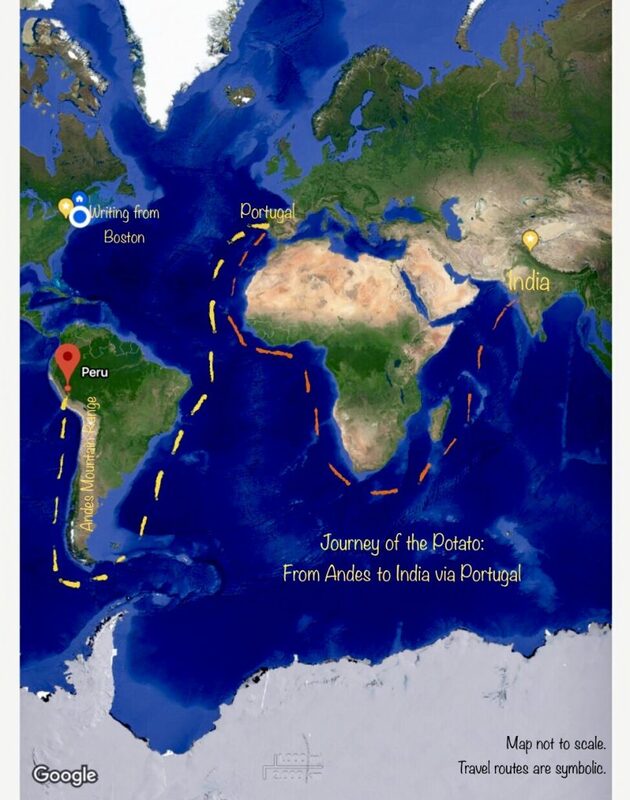 Isn’t it beautiful that a crop of Andean origin that came to India with the Portuguese now has varieties named after a beautiful Himalayan town. There are varieties called Kufri Jyoti, Kufri Chandramukhi, Kufri Pukhraj and so on. Ofcourse Kufri is not the only place in India that produces potatoes, other states too Uttar Pradesh, Bihar, Gujarat, Madhya Pradesh etc also contribute a sizeable chunk to India’s potato produce. But coming back to the point, the Pahadi variety of potatoes, especially the newer crop is particularly popular amongst us Delhites. 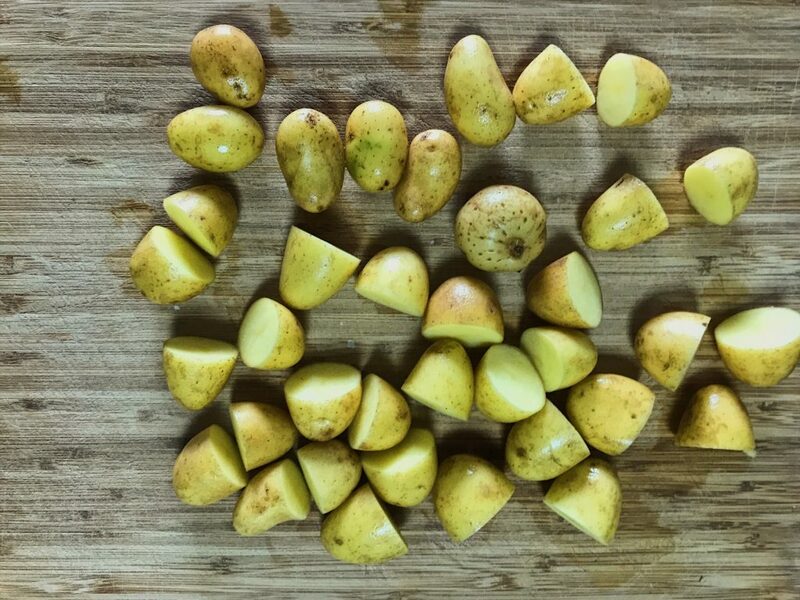 My mother recalls that until about 10-15 years ago, when the Sabziwalah used to bring potatoes on his cart, they had to sift through the pile to look for smaller sized potatoes. It is only now that one finds them packaged in net bags on Sabziwalah carts. These smaller potatoes would be then put in pateelas full of tap water to remove all the dirt. The Chhote Aloo would then be rinsed several times and wiped which would help remove the thin peel off them. Of the peel wouldn’t come off, it wasn’t a problem because it would only make the dish crispier. 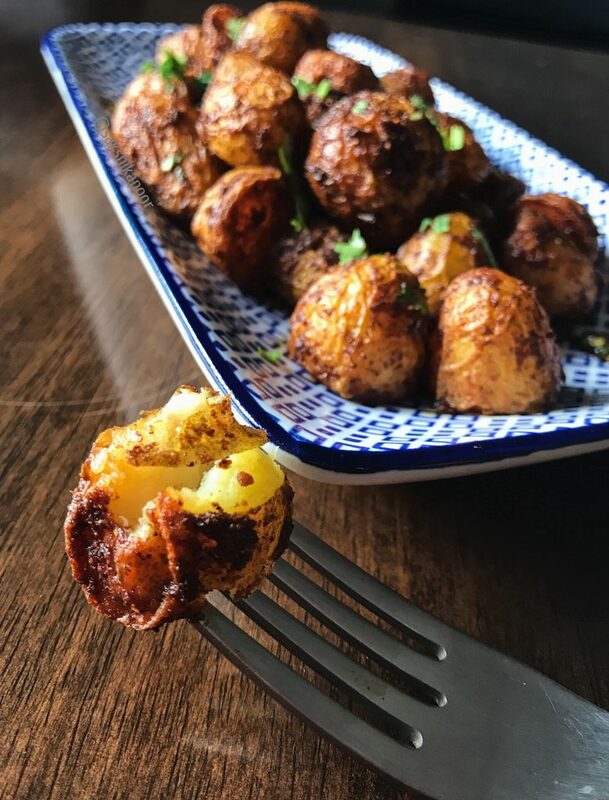 The outside of the potatoes is coated with delicious spices while a bite into it reveals a basic earthy soft centre that balances the spice. The spiciness and the Chatpata-ness (the tang!) 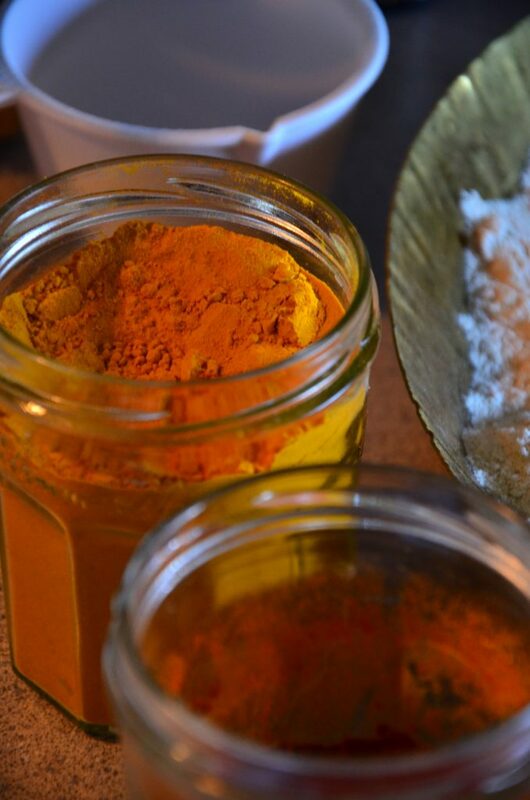 can be adjusted with the amount of Amchur or dry mango powder you use. If you don’t have Amchur, you can use Anardana (dried Pomegranate seeds) or just plain simple lime juice. 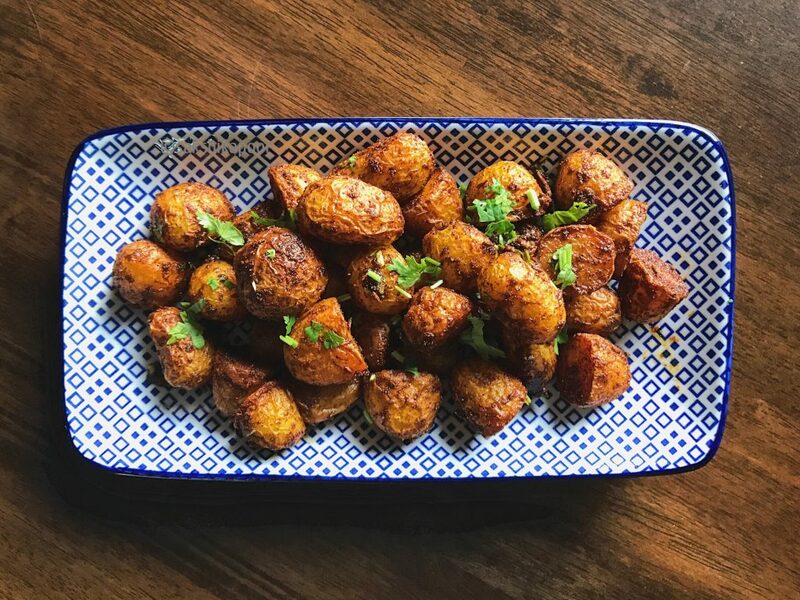 On a recent discovery about National French Fries day being a thing in the USA, Kanika and I decided to share our recipes for some Indian style Potatoes dishes. I did struggle to find small potatoes at my local supermarket, but eventually did come across small seed potatoes from France which were a little over priced but were totally worth it. Start by washing and rinsing the potatoes until the dirt comes off. This dish requires potatoes to be unpeeled so pay attention to this step. Pat dry them after final rinse. If the potatoes are bigger, you may halve them or just prick them a bit with a fork or a knife. In a kadhai or heavy bottom pan (that comes with a lid), pour oil and heat on medium high heat. Of using Mustard oil, wait till you see it smoking. For other oils, you may proceed to the next step if you think the oil is hot. Now add in the cumin and wait for it to bloom. Add the potatoes next followed by salt and turmeric. After this, stir the potatoes carefully by avoiding any hot oil splashes. Stir till you have mixed the turmeric and salt in. Now cover and reduce the heat to medium low. Cook for 5-7 minutes. Check the potatoes and give them a stir at intervals to avoid burning them. Stirring them also helps browning them evenly. Try to pierce the potato with a knife to see if it is cooked through. Once the potatoes are a bit softer, add the Amchur and other spices and stir nicely. Cover and cook again at medium low heat for another 5-7 minutes by checking them at intervals. Once the potatoes have a brown wrinkly skin and have nicely coated with spices, you can take them off the heat. Serve Chatpate Chhote Aloo with your favourite Dal, roti and rice to enjoy a quintessentially North Indian spread! A delicious spicy and tangy Indian style potato dish with seed potatoes cooked whole. Spicy and crispy on the outside and soft and plain on the inside, they are the perfect addition to any Indian spread. The spiciness and the tanginess can be adjusted with the amount of Amchur or dry mango powder you use. If you don't have Amchur, you can use Anardana (dried Pomegranate seeds) or just plain simple lime juice. If using lime juice, add it in the end. What kind of dishes do you make?